A unique and eco-friendly Los Angeles landscape design idea is building a koi pond. A koi fish pond is built right in your backyard or garden to house Nishikigoi, ornamental Japanese carp. 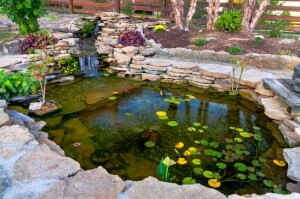 This pond is an affordable addition to most homes that offers several benefits and very little maintenance. Grass Replacement – California is currently facing a severe drought, and one of the biggest water wasters is a lawn. In fact, the Department of Water and Power (DWP) is urging homeowners to get rid of their grass altogether to save the water needed to water it. A great replacement for green grass is a beautiful koi pond. Relaxation – There are several water features you can install as part of your Los Angeles landscape upgrade, such as a water fountain, a pool, or a koi pond. However, a water fountain and a pool still require constant amounts of water, while a koi fish pond requires little water, and is often refreshed runoff water and rain in the winter months. A koi pond has been found to promote relaxation and tranquility; observing the bright and beautiful patterns of the koi often leads to reduced stress levels. Increased Property Value – Installing Los Angeles landscape upgrades to a property usually leads to higher home value. An aesthetically pleasing koi fish pond will surely impress possible homebuyers or renters. Building a koi pond as part of your Los Angeles landscape is not an easy task, and is best left to professionals. A Los Angeles contractor who specializes in building koi fish ponds will be able to consult you on the best plan. Pick a Location – The location for a koi fish pond needs to be able to accommodate digging at least a few feet without any electric or water sources nearby. The area needs to be clear of any trees or vegetation that can result in leaves falling into the pond as the koi can eat them, yet provide some shade for the fish. A koi pond should ideally be built in the lowest part of your land. This is best, as the remaining water from the grass will refill the pond. Remember that you cannot use any fertilizers in the surrounding grass, if any, as it can kill the fish. If you will build on a slope such as a hill or mountain, you will need to build a wall that will prevent the water from running or leaking out. Also, select where you want the runoff water from the koi pond to go to. Choose Koi Pond Filtration – Koi ponds typically require filters to be installed. There are various types of filters, you can install just one or more depending on your needs, or purchase a combination filter. A mechanical filter uses numerous levels of sponges to filter leaves and algae from water to keep in clean. This koi fish pond filtration system keeps the greenery from rotting in the koi pond and from being eaten by the koi, as well as preventing clogs. Another sort of filter, a biological one, uses bacteria to attack levels of ammonia that naturally builds up in koi ponds. Ammonia is detrimental to koi’s health, and promotes the overgrowth of algae. These biological filters convert ammonia into nitrites, and then into nitrates, which benefit surrounding greenery. A chemical filter uses carbon and resin to remove organic and inorganic waste, such as chemical pollutants that are dangerous to the fish from the pond. Installing a koi pond as part of your Los Angeles landscape does require significant expenses up front. However, the benefits of an aesthetically pleasing water feature to promote your relaxation, and a possible increase to your house’s value are good reasons to consider getting a quote from a qualified Los Angels koi pond installer. To get a quote for building your own Los Angeles koi pond, contact us.